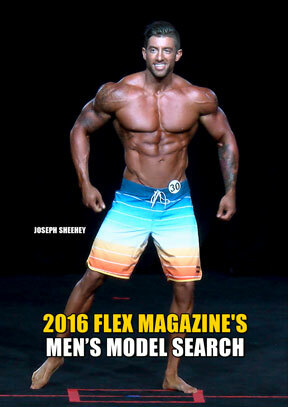 Flex Magazine’s Male model search from the 2016 Olympia Expo Stage. Judged by Muscularity and condition, stage presence and charisma. Judges look for fit contestants who display proper shape and symmetry combined with muscularity and overall condition. This is not a bodybuilding contest, so extreme muscularity is not necessary. Contestants walk in board shorts with no shirt and no shoes across the stage (no tight shorts or shorts mid thigh are allowed). Judges look for the contestant with the best stage presence and poise who can successfully convey his personality to the audience.